At designated times throughout the year, the SpartanNash Foundation invites the communities it serves to join it in supporting key initiatives in partnership with our national, regional or local 501(c)(3) nonprofit partners. This is done through a retail scan, where we invite store guests — primarily at our Family Fare Supermarkets, D&W Fresh Market, VG’s Grocery, Dan’s Supermarket and Family Fresh Market stores — to join the SpartanNash Foundation and our associates by donating at the checkout register. Retail scan partners are carefully selected to ensure the dollars raised are effectively utilized in the communities where they are raised. Small donations – in partnership with the Foundation’s financial contribution, associates’ support and SpartanNash’s underwriting of retail scans’ operational expenses — add up to make a big impact. As with other SpartanNash Foundation grant recipients, we encourage our associates to volunteer with these organizations. One of our most significant impacts can be seen in our 35-year partnership with Special Olympics. To date, we have donated nearly $9.4 million and hundreds of thousands of volunteer hours to Special Olympics’ inclusion efforts, in addition to providing meals for Summer Games volunteers. In 2018, we raised and granted more than $1 million through four companywide scan campaigns, benefiting local Habitat for Humanity, Special Olympics, patriotic and food pantry partners – the second consecutive year the fundraising efforts have topped $1 million. 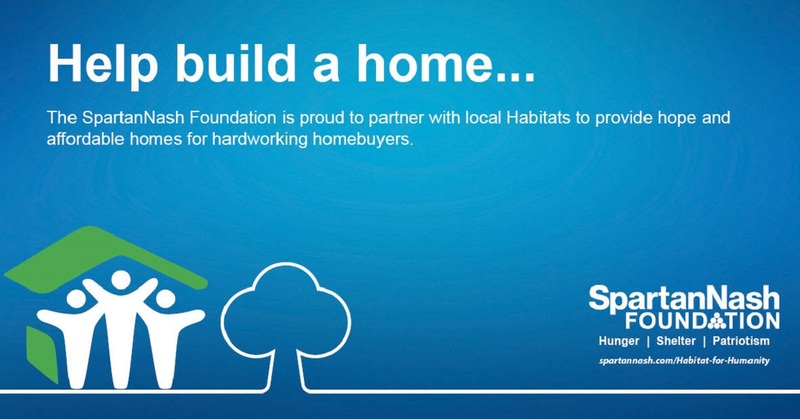 Together with our store guests and company associates, the SpartanNash Foundation’s scan campaign to build hope and affordable housing raised $179,500 on behalf of more than 50 local Habitat for Humanity partners in Michigan, Iowa, Minnesota, Nebraska, Ohio, North Dakota, South Dakota and Wisconsin. Since 2006, nearly $1.9 million has been raised by SpartanNash and its charitable giving arm – the SpartanNash Foundation – to support local Habitats and hardworking homebuyers. See the complete list of participating SpartanNash stores and their state Special Olympics partner. Since 2015, the SpartanNash Foundation’s retail scans have raised and granted more than $3.2 million to nonprofit partners, impacting local communities throughout our retail footprint. Habitat for Humanity: $176,700 Together with our store guests and company associates, the SpartanNash Foundation’s scan campaign to build hope and affordable housing raised $176,700 on behalf of more than 50 local Habitat for Humanity partners in Michigan, Iowa, Minnesota, Nebraska, Ohio, North Dakota, South Dakota and Wisconsin. Since 2006, nearly $1.7 million has been raised by SpartanNash and its charitable giving arm – the SpartanNash Foundation – to support local Habitats and hardworking homebuyers. Special Olympics: $286,500 The SpartanNash Foundation’s Special Olympics scan campaign raised $286,500 on behalf of athletes and State Summer Games in Iowa, Michigan, Minnesota, Nebraska, North Dakota, Ohio, South Dakota and Wisconsin. 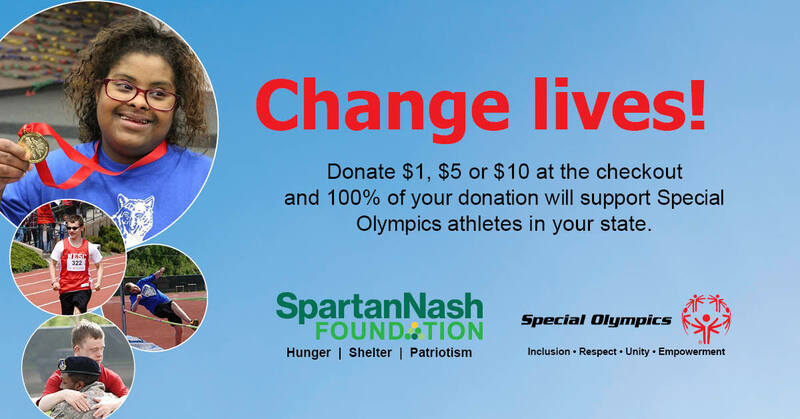 Since 1985, SpartanNash and its charitable giving arm, the SpartanNash Foundation, have donated nearly $9.4 million and thousands of volunteer hours through its partnership with Special Olympics. Supporting our military heroes: $310,000 The SpartanNash Foundation’s retail scan to support our military heroes and their families was its most successful companywide retail fundraising effort to date — raising $310,000 on behalf of Operation Homefront and Honor and Remember. 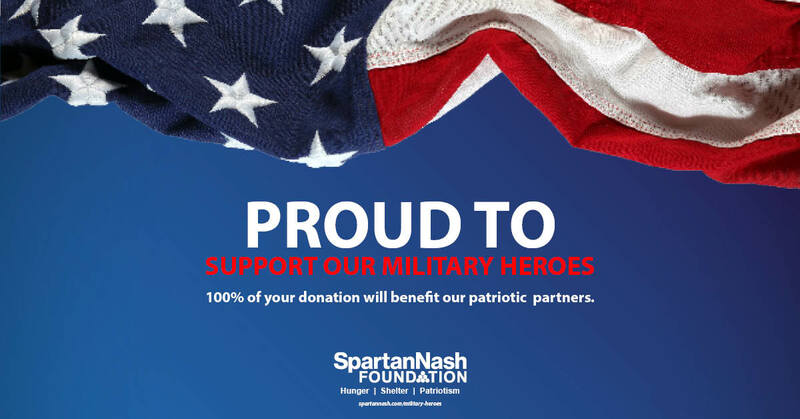 Since 2016, the SpartanNash Foundation has raised and granted nearly $800,000 through its retail scan campaigns, benefitting patriotic partners including Give an Hour, Fisher House Foundation, Blue Star Mothers of America, Inc., Disabled Veterans National Foundation – and this year’s partners Operation Homefront and Honor and Remember. Ending hunger in our local communities: $278,105 Together with store guests and company associates, the SpartanNash Foundation’s scan campaign to provide hunger relief raised $278,105 to support more than 100 local food pantries and food banks in Michigan, Iowa, Minnesota, Nebraska, Ohio, North Dakota, South Dakota and Wisconsin. Each store selected the local community food partner its campaign would support, ensuring the scan to end hunger would have a significant local impact. Habitat for Humanity: $201,600 In 2017, the SpartanNash Foundation continued its partnership with Habitat for Humanity, supporting more than 50 local Habitat affiliates in eight states. The 2017 fundraising total represents an 82 percent increase over the previous year’s retail scan campaign. Special Olympics: $281,000 Together with its store guests and company associates, the SpartanNash Foundation’s scan campaign to support Special Olympics raised $281,000 on behalf of Special Olympics athletes and State Summer Games in Colorado, Iowa, Michigan, Minnesota, Nebraska, North Dakota, Ohio, South Dakota and Wisconsin. As a result, more than 20,000 Special Olympic athletes will have the opportunity to compete with other children and adults with intellectual disabilities and experience the joy of seeing themselves for their abilities, not disabilities. Supporting our military heroes: $300,000 Between June 28 and July 9, 2017, the SpartanNash Foundation invited store guests to join us in supporting our military heroes through Give an Hour™ and Honor and Remember®. The SpartanNash Foundation’s scan campaign to support our servicemembers, veterans and their families was its most successful companywide retail fundraising effort in 2017 – raising $300,000 on behalf of our patriotic partners. Ending hunger in our local communities: $259,150 For its fourth retail scan campaign of 2017, the SpartanNash Foundation’s scan campaign to provide hunger relief raised $260,000 to support local food pantries and food banks. 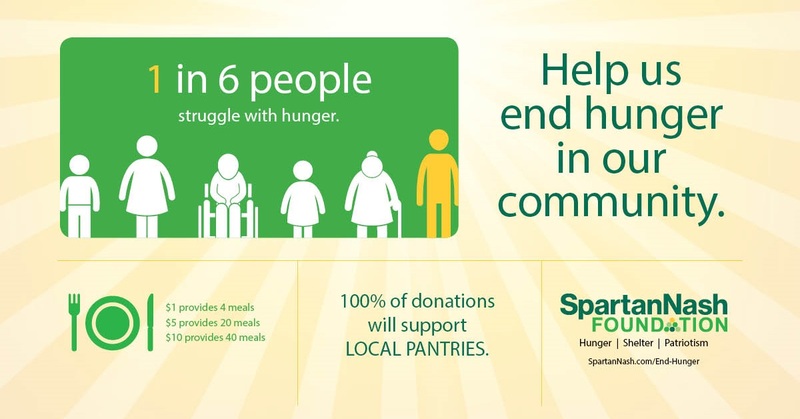 Each SpartanNash-owned store in eight states personally selected the local community food partner its campaign would support, ensuring the scan to end hunger would have a significant local impact. Habitat for Humanity: $114,500 In 2016, the SpartanNash Foundation expanded its partnership with Habitat for Humanity beyond Michigan, adding retail scans at its corporate-owned stores in Iowa, Minnesota, Nebraska, Ohio, North Dakota, South Dakota and Wisconsin. As a result, 59 affiliates will build hope and homes in partnership with hardworking Habitat home buyers. Special Olympics: $231,650 In 2016, the SpartanNash Foundation expanded its partnership with Special Olympics beyond Michigan to include retail scans at its corporate-owned stores in eight additional states — Colorado, Iowa, Minnesota, Nebraska, Ohio, North Dakota, South Dakota and Wisconsin. As a result, more than 20,000 Special Olympic athletes will have the opportunity to compete with other children and adults with intellectual disabilities and experience the joy of seeing themselves for their abilities, not disabilities. They become confident and empowered by their accomplishments, make new friends, raise awareness for inclusion and acceptance — and have a lot of fun. Supporting our military heroes: $182,000 Between June 22 and July 4, 2016, the SpartanNash Foundation launched its first-ever companywide fundraising campaign to support our military heroes and honor those who lost their lives defending our freedoms. The scan – which took place in more than 160 retail stores and fuel centers in nine states – benefitted our national partner Honor and Remember, as well as three regional community partners. Ending hunger in our local communities — $294,350 For its fourth retail scan campaign, the SpartanNash Foundation hosted a companywide effort to help end hunger in the communities we serve. Each of our retail store locations personally selected the local community food partner its campaign would support, ensuring the scan to end hunger would have a significant local impact. In total, our stores raised nearly $300,000 during the 12-day scan — making this the SpartanNash Foundation’s most successful scan to date. Habitat for Humanity: $123,693 raised and granted to 40 county-based affiliates in Michigan. Special Olympics: $165,000 raised and granted to Special Olympics Michigan.